Being fifty-something, I grew up in a house where bottling with your Fowlers Preserving Kit was de rigueur. The backyard was full of fruit trees and mum made sure they lasted all year long. I’m not a bottler myself, but I still can’t go past a Fowlers bottle (or jar). I found this one a couple of months back in a thrift store. For the princessly investment of $1 it was mine. I love the slight greenish tinge to the glass, the sleek utilitarian lines and the chubby rim at the top. It has an almost industrial feel. I’ve been trying to work out since, what to do with it. 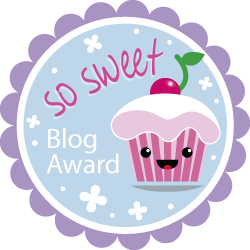 I toyed with upturning it over a special knick-knack (been loving all those glass domes I see in the décor style shots) – but it’s very tall and the thickness and quality of the glass make it highly refractive so it’s hard to focus on what’s inside. I’ve had tiny porcelain birds nesting on top and inside of it. I’ve had it filled with garlic cloves and stuffed with lanky blooms. 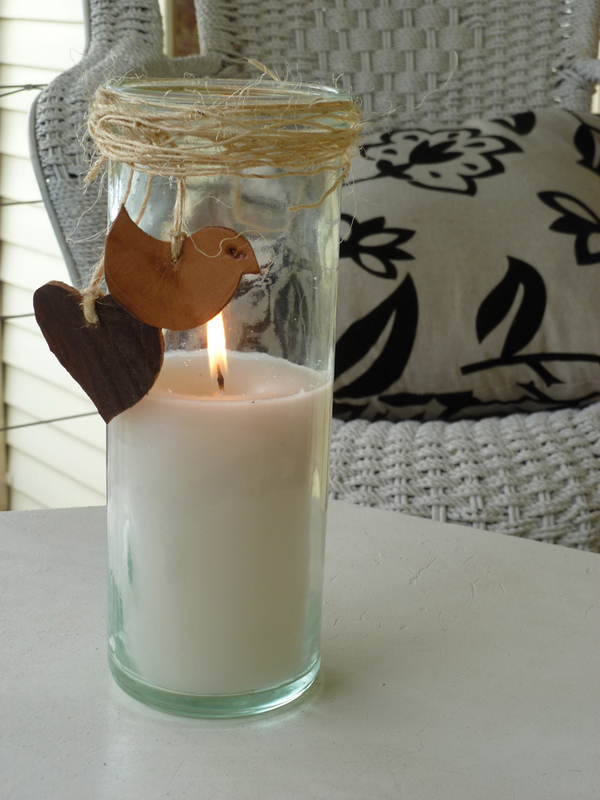 Given the materials left over from this project, I imagined the Fowlers jar could make a great candle … an outdoor candle where the glass would protect the flame from the breeze. A candle in the wind. 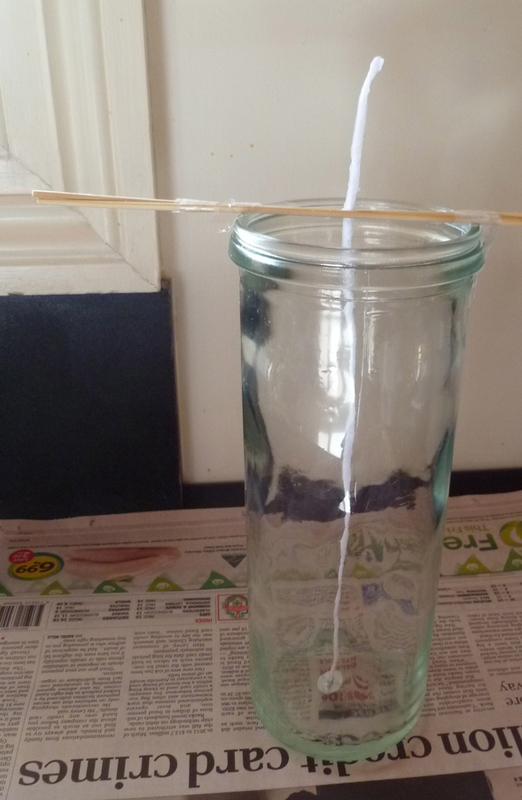 I cut a long wick, attached it to a wick holder, centred it in the jar with a couple of taped-together bamboo sticks and poured in melted wax to half-full. It was trés boring (even for my tastes). 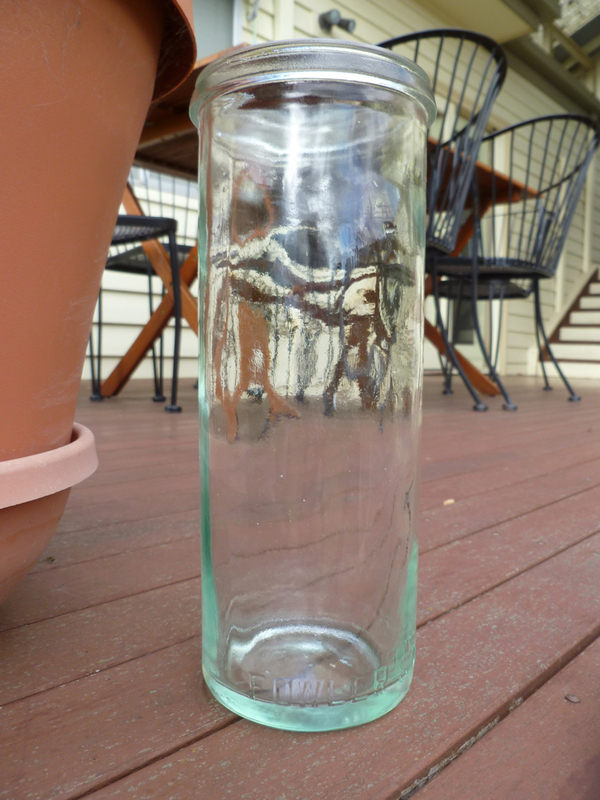 Then I saw this blogpost about jazzing up a jar by Alex over at Hello from Tassie. Have you noticed I get a lot of inspiration from Alex? I wish she was still my neighbour … then I could pick her über-crafty brain any old time. Alex used string and a clay shape to embellish a (Fowlers!) jar as a gift. I didn’t have any clay shapes but … another light bulb moment … I did have some old leather. Really old leather. I mean really, really old leather from a vintage railway worker’s bag that was not repairable, but with which I couldn’t part. The leather inside the bag was pale and unweathered compared to that on the outside. 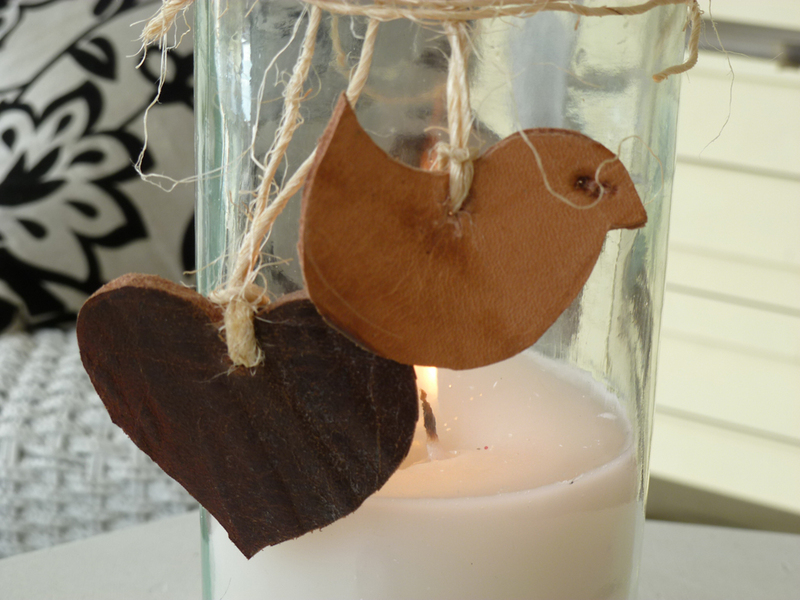 I hand-drew a couple of motifs and cut – just using scissors – a bird and a heart shape, one from each of the leather types, then strung them from the chubby rim on some furry, jute string (that looked a little nest-like by the time I finished). With my princessly investment still at just $1, and using a few materials I already had at hand, this is that simple, inexpensive craft “holy grail” I’m relentlessly searching out. Can’t wait for spring evenings on the deck and giving this bottler a trial. Next Post When will I ever grow up? Coming from a long line of “canners”, I’ve got lots of preserving jars. I might make some candles in the wind with those I don’t fill with jam. Thanks for the idea.